It is a common misconception that yoga is a practice whose value lies primarily in its mental workout properties. Contrary to this popular belief however, power Yoga's universal appeal is actually derived from its ability to restore calm, while simultaneously burning excess pounds. Seeking an activity that will alleviate your experience of two menopause symptoms concurrently? Power yoga could be the perfect workout for you. 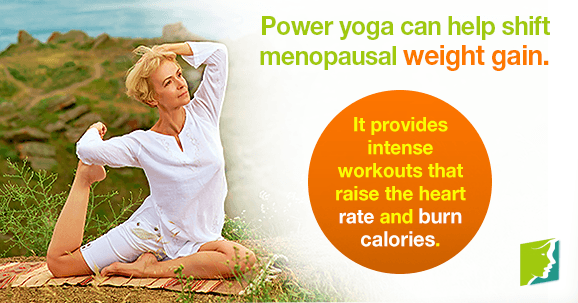 Read on to discover how power yoga can help shift menopausal weight gain. How Is Power Yoga Different from Traditional Yoga? Yoga in its traditional form originated in India over 5,000 years ago. It is unsurprising therefore, that the intermittent years have given rise to the subsequent development of many varieties, styles and techniques. Power yoga most closely resembles the vinyasa style of ashtanga yoga- a form that is characterized by its focus on smooth, fluid sequential movements. The style is particularly popular because of the excellent cardio aerobic workout it provides. While traditional ashtanga is intimately linked with an overall philosophy that encourages spiritual enlightenment, power yoga is primarily performed for fitness reasons.Although, attaching personal spiritual meaning to power yoga workouts is not uncommon. How Often Should I Do Power Yoga? While traditional yoga burns 240 calories on average, if performed correctly, power yoga can help women to burn an additional 200 calories. In order to reap the benefits of yoga, start by practicing three times a week. How Can Power Yoga Help Me Lose Weight? Most yoga instructors will tell you that the frequency of your yoga practices is a personal decision depending on your body and its fitness level. Power yoga, and all forms of vinyasa yoga, provide intense workouts that raise the heart rate and burn calories. Alternate your classes every once in a while to avoid monotony.